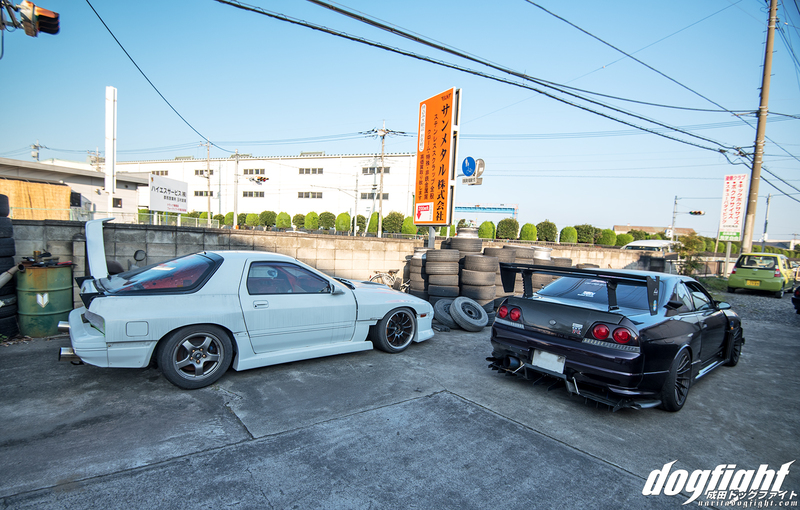 Tucked away in the Southern countryside of Gunma, situated on a corner just behind a beautifully scarce rice field, in a very cliche Japanese building, lies a haven of meticulously crafted engine bays that rivals that of any other shop in the country. In fact, if you weren’t looking for it, it wouldn’t be hard to pass it by, writing it off as just another unmarked building in the foreground. 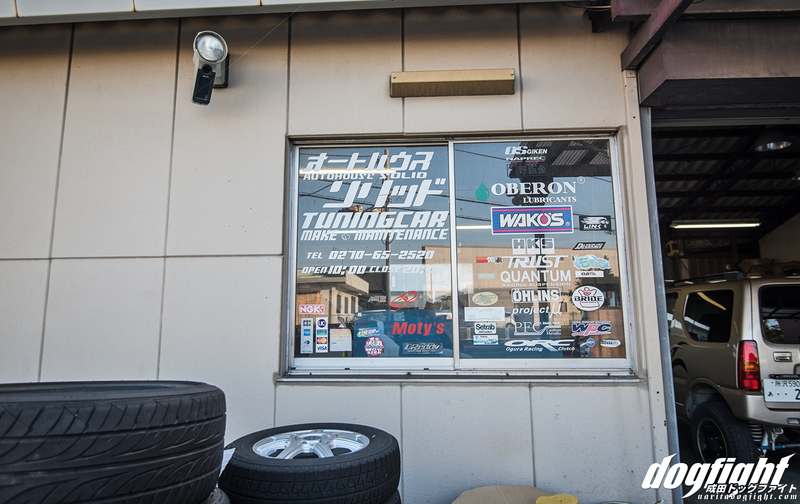 The unassuming tuning shop Auto House Solid, is owned and operated by Hayashi Kazuyaki; the foremost authoritarian on what a clean motor package should look like. In fact, Hayashi-san himself jokes that the appearance of his cars may come off as mediocre, or half-built (which honestly isn’t true), but his motor will always be absolutely perfect looking and run strong. One look at his current R32 build would prove the man correct in every facet of that statement, albeit unfinished. Aside from his personal car, however, every full motor that Hayashi is tasked with building comes out with a show quality aesthetic. You can really tell he takes pride in his craftsmanship, and it’s one of the main characteristics that sets Auto House Solid apart from other similar shops. By not exchanging form for function, although, leaves Hayashi quite stacked with work. It’s a one man show, and his work takes awhile, so he has a lot of pending cars on the table that are parked around the shop. As I was leaving Nagano the prior day, my friend Amemiya had told me Hayashi was messaging him asking if I was going to visit the shop. Since Gunma/Saitama area is on the way back to Yokohama from Nagano, I made a slight detour off the Kan-etsu Expressway to say hello. When I arrived, I parked along the alleyway and made my way to the front of the shop. I heard the ever-cheerful voice of Hayashi before I saw him, I think Ame let him know I was coming because it seemed like he expected me. At the moment, he was busy working on a customers Jimny, so as he finished up, I wandered around the grounds to check out the customer cars. 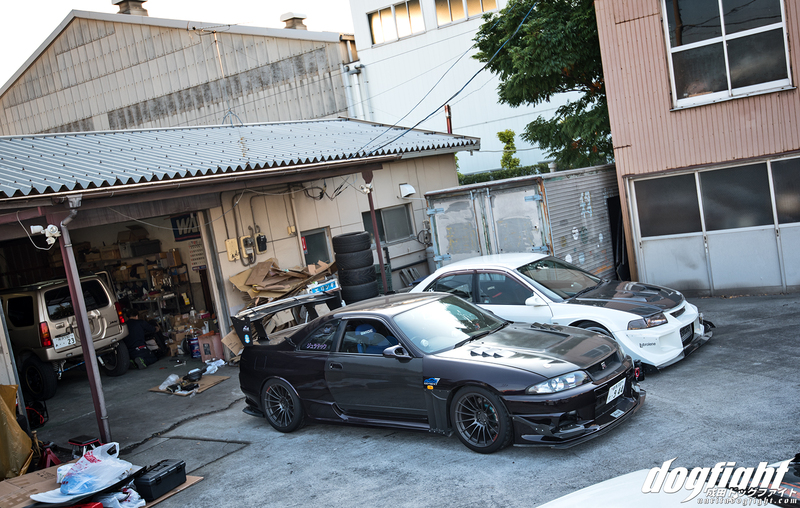 Igarashi-san’s R33 and Morita’s TM Edition CP9A were front and center. Morita’s car had been there for awhile, I suppose, as Hayashi was making some weight reducing modifications to the rear of the car. 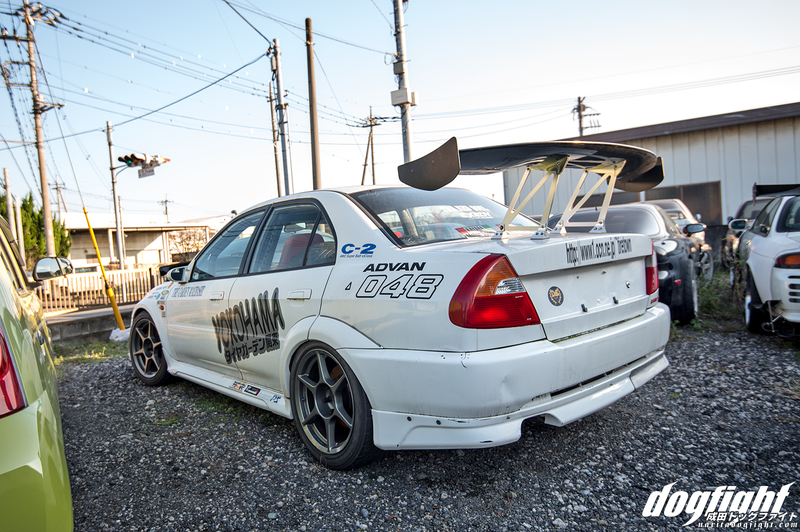 …having no need for the spare tire well, he opted to cut it out and replace with a sheet of carbon to reduce unneeded weight, and allow for the more effective use of a rear diffuser. (Of course, now I want to replace the aluminum I used with carbon as well). 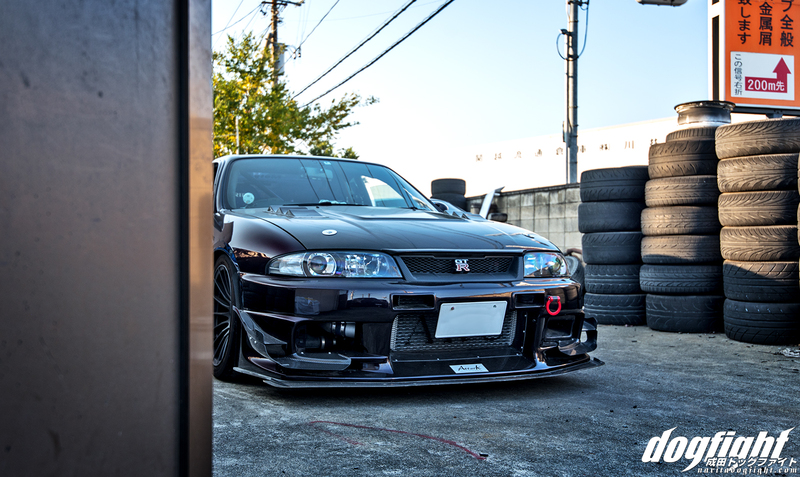 Igarashi’s R33 had gone through quite a few changes since I saw it last, the most notable being full carbon doors. I’ll have a feature on this car in the coming days so I won’t go into too much detail here. He was at the shop getting some new tires mounted for an upcoming event he, and some of the other shop cars will be attending at TC2000. You may, or more realistically in it’s current state, may not remember Ito-san’s FC from our meeting earlier in the year. It’s looking rather, bare, for a lack of more positive term, but this state is not a permanent one. 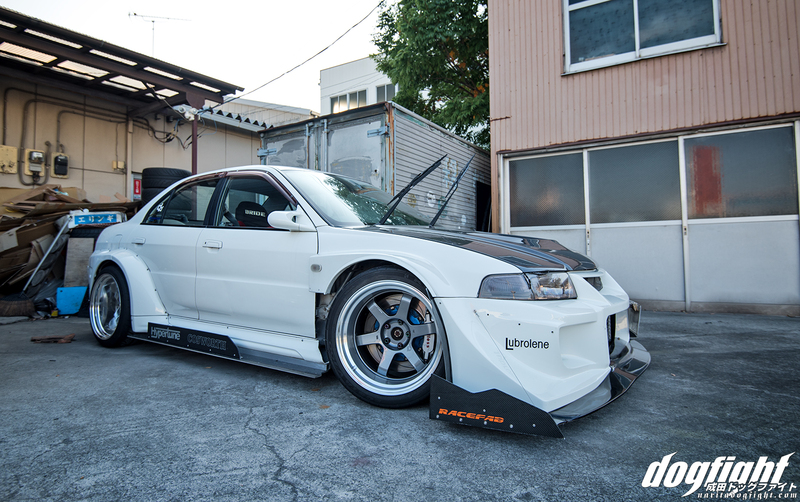 Awhile back Ito dropped the car off at Hayashi’s shop for a complete refresh to include a custom dash with new gauges, freshly painted interior, a Saito roll cage, carbon door cards, new engine seals and a new electric power steering setup. 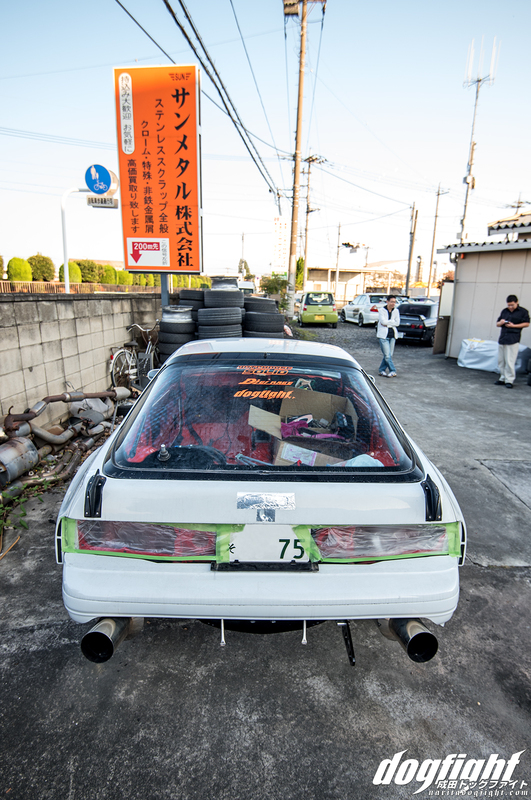 With storage space being hard to come by, the car was conscripted to staying outside, so Ito took off all the ‘look good’ bits in the mean time so they didn’t get damaged in the typhoons the country has been having. Around the corner of the shop was some more cars, both past and present customers, that were either awaiting new assignment or work. 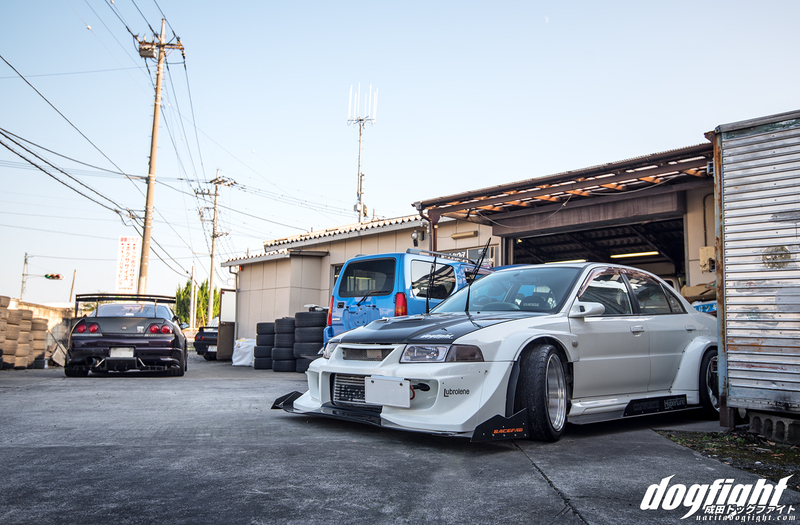 Cars like this EVO with the ever-present broken URL decal on that back. Good look with the Buddy Club P1 wheels; kind of like a mixture of rally and road race. 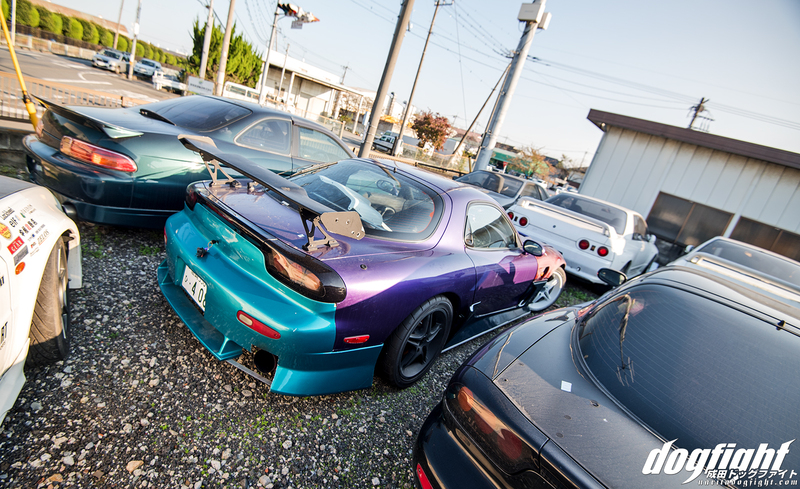 This customer’s drift-spec FD was awaiting work next to another FD that I can only presume is going to be there indefinitely or until I decide to purchase it…Various Skylines and other classic tuner cars were scattered around the lot as well. I can’t tell you if I’m certain of how this will look after it’s all said and done, but Ito wanted the interior of the FC painted orange; a favorite color of his. 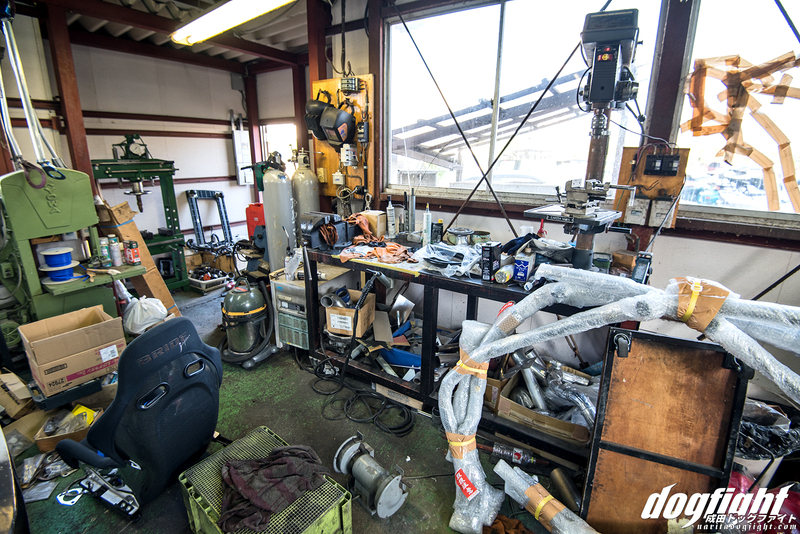 The inside of the shop is almost exactly how you’d picture a one-man owned and operated shop in the countryside of Japan; an organized disarray. Parts for ongoing builds positioned wherever he last left off working on them, and the tools he was using right next to them. Ito’s new roll cage was leaned up against the work bench, a carbon Bride was just kind of there…sort of reminded me of NORUSH. …naturally. 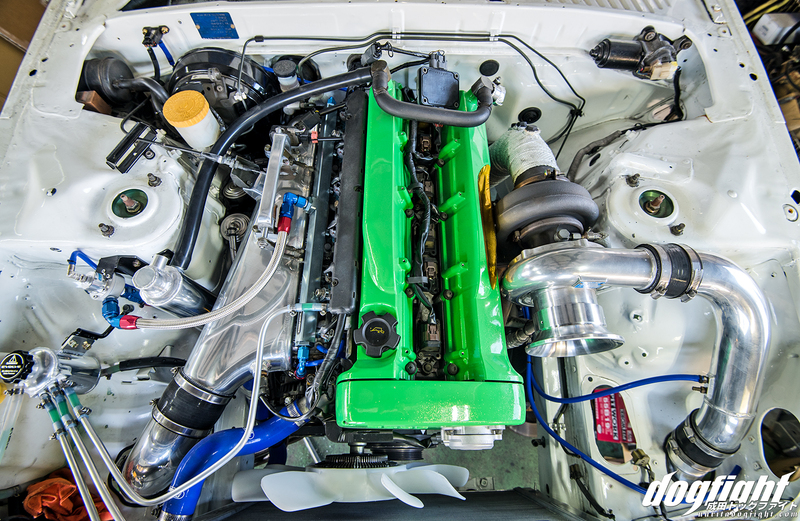 One of the cleanest RB26 engine bays I’ve seen in a long time, complete with a new, single T88 turbine in place of the smaller twin setup. Looks like he’s going for high power this time. I didn’t have time to discuss the details, but I can only imagine what this motor is capable of. Little custom bits like this overflow and piping are what make or break engine bays; devil’s in the details. 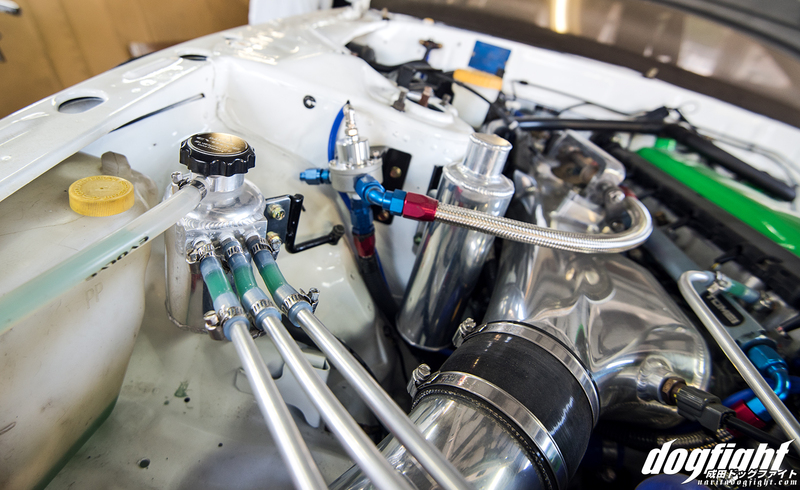 With the engine complete, Hayashi is now concentrating on reassembling the car in his spare time. 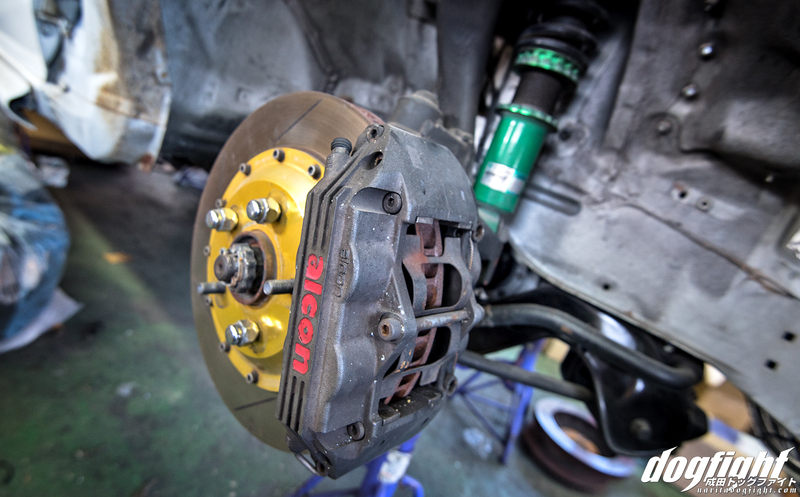 These may or may not be the first set of Alcon brake calipers ever made…just kidding. 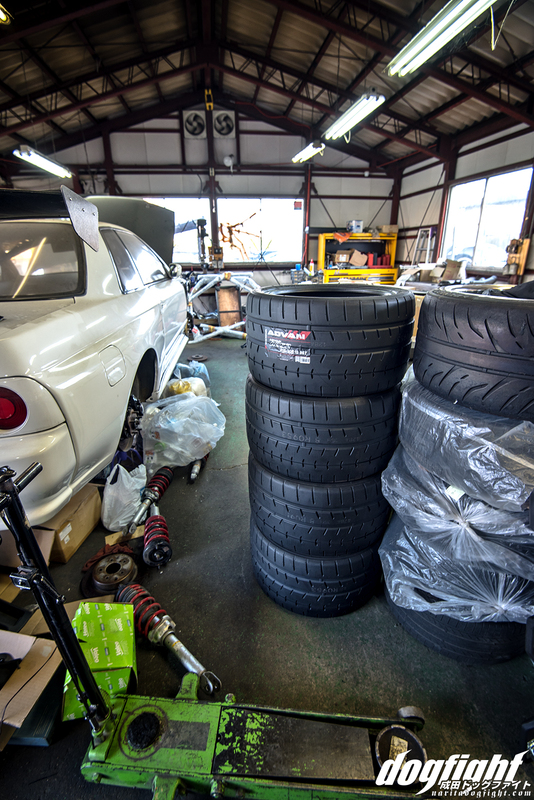 Massive 315 Advan A052’s for Igarashi’s R33 await the tire changer. 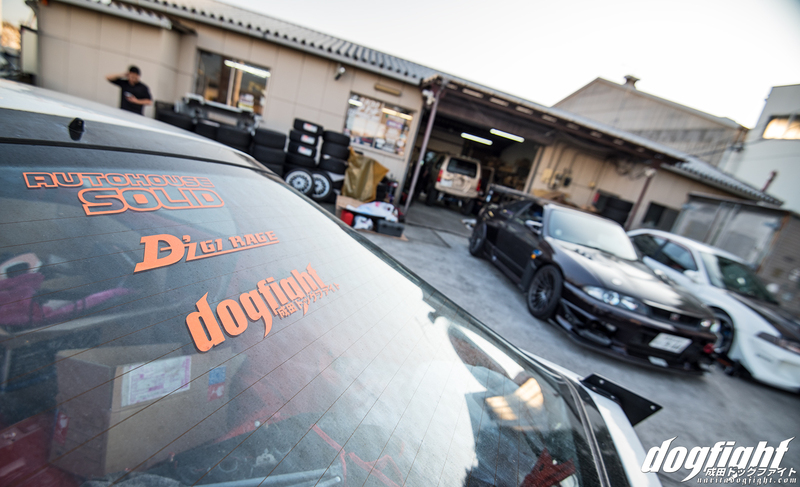 It was neat getting to check out Auto House Solid, a workplace that Hayashi spends the entirety of his time; not just because he works a lot, but because it’s also his home. His actual house is attached to the back of the shop, so saying he lives at work isn’t even an exaggeration. Thanks for having me, Hayashi – see you in a few weeks!